Everyone has his or her own way of doing this, but I have found reading others’ schedules has helped me find the schedule that is working for us right now. I have done this various ways, but right now what is working is this. First, make a list of all the subjects you want to teach your children and the things you use to teach that subject. I use multiple curriculum for single subjects like writing and Latin so the second part of this first step is important to me, but may not be to you. Now decide how often you will teach each subject. In our home, math is daily, as is French and Spanish with Mango Languages. However, Latin is twice a week, and Art and Nature Journal is once a week. Monday afternoons, the kids have an enrichment afternoon at a church, where they do history, art, music, and drama. I only have (realistically) 2 hours of teaching time in the morning because we need to eat lunch at 11 to be there at noon. I can squeeze in memory work, Bible readings and prayer, math, piano and maybe one other thing. I don’t schedule any read alouds that day as a result. 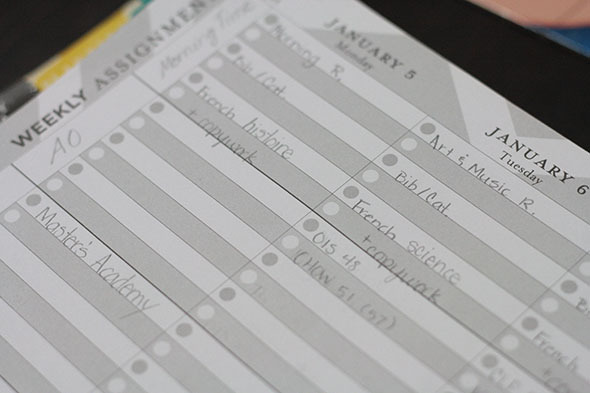 Think about your schedule and what days you aren’t home to teach or which days you are out of the house part of the day so you can realistically set out your subjects through the week. Bear takes an inordinate amount of time to do math. We have just figured out that headphones and classical music help her concentrate, so perhaps she’ll be able to be more efficient at math in 2015. However, we stick to short lessons as per Charlotte Mason, so she gets 30 minutes. Whatever isn’t done in that time gets called homework for the afternoon, or if it was an especially long lesson and she actually stayed on task, I might just let her finish the lesson the next day. Our state mandates 4.5 hours of school per day for homeschoolers (age 6 – or first grade – and up), 180 days per year. Morning Time and Read Alouds, which I did not take into account in my list because I plan those separately, take at least 1.5 to 2 hours so I want what I listed in my workbook (see photo) to take about 2.5 to 3 hours to get to my total of 4.5 hours. Basically what I then did was figure out how many subjects per day were realistic and then I juggled the two and three day per week subjects against that number. Our happy number seems to be 8 subjects per day. For example, Tuesday, a day when we are home, Bear gets piano (30), logic/Cursive/English from the Roots Up (30), Spelling (15), Writing (30-45), Latin (20-30), French and Spanish with Mango (30 – 15 minutes each language), Geography map memory work (15). This is about 3 hours of work. The kids do Logic every day. Sometimes I make them do workbooks, but mostly it is games such as Smart Car, Camelot Junior, Smart Cookies, and Color Code. These games help break up all the seat work, yet count as school time because of the nature of the games. J-jo isn’t old enough to report yet, so this year I haven’t paid attention to how long his school day is, but looking at my list, it is closer to 1 to 1.5 hours of seat work, except maybe for the days we do art. 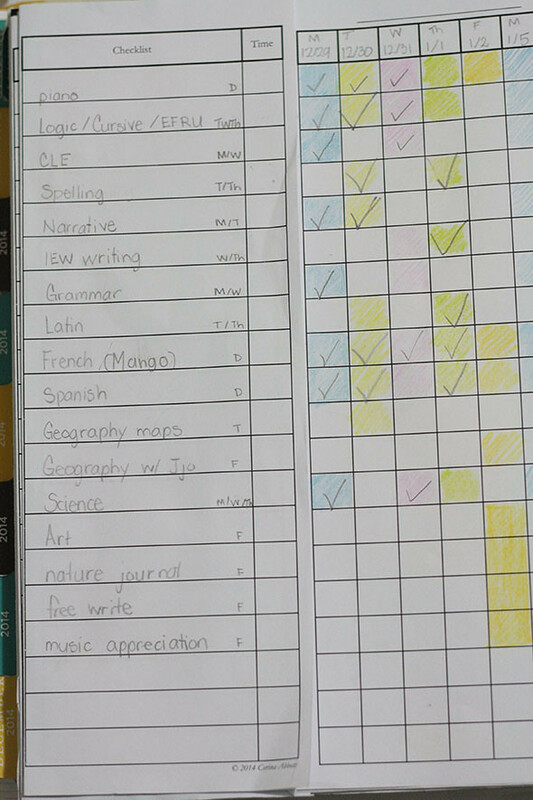 I use My Student Logbook (favorite thing I reviewed last year!) to keep track of Bear’s work. 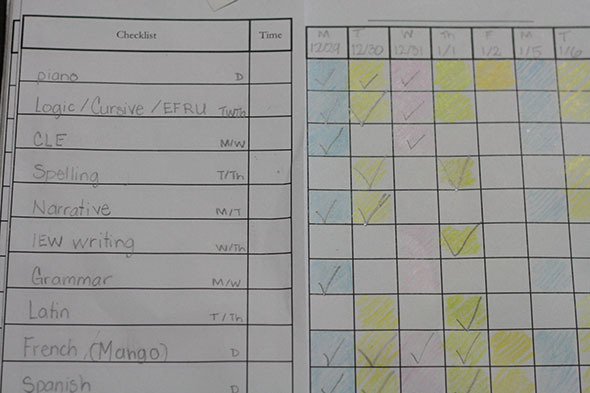 I color-code her days and she can see at a glance how many things need to be done each day. 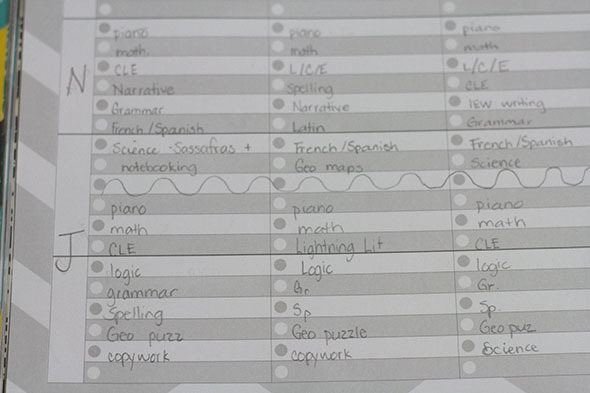 J-jo’s list just gets put in my “A Simple Plan” homeschool planner, but next year he will get his own My Student Logbook. Morning Time stays the same every day. Bible reading, prayer, morning recitation (aka memory work from Classical Catholic Memory), catechism (we work through the catechism and also read from a rotation of saint books and stories that exemplify virtues), and everyday I try to read a blurb from a French history book or a French science book, as well as a French picture book. Read Alouds are from Ambleside Online. Our history is worked in there, as is Bear’s literature. I also read our science books during this time. To schedule this out, I took the Ambleside Year 2 reading schedule and spread it out through the week so that history is read on Tuesday, Science (not AO) is read on Wednesday and Thursday, and literature and geography is read on Friday. If we have extra time on a Monday in spite of the enrichment afternoon classes, I will also add a bit of literature readings on that day. We also read aloud at bedtime, but those aren’t considered “school”. And that is the system that is working for me. How do you do your planning? Is it much different? 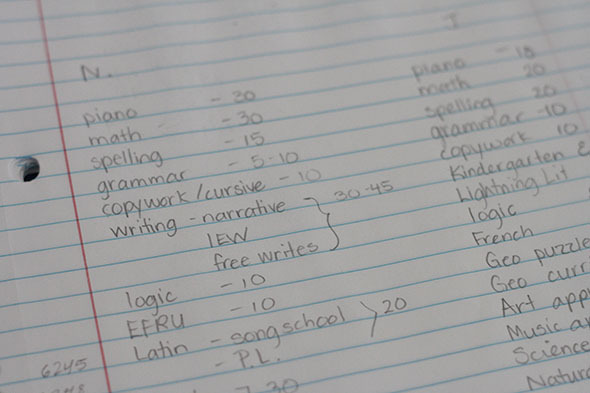 This post is part of the Homeschool Logistics series.